What is probably an Iranian tandem HEAT projectile. Photo: Lens Young Homsi. He couldn’t be more correct. Often times I have turned to fellow researchers, technical specialists, or translators – almost always on an informal basis – to help me put together another piece of a given puzzle. Without such a network, much of the valuable research we conduct as individuals would exist only in a vacuum, and would be of little ‘real world’ value. In return, of course, I receive requests for assistance on a daily basis. I’m happy to help almost all of these people, time and knowledge permitting. For this piece, a Syrian activist, an MP.net forum member, an amateur arms researcher, and a conflict correspondent have all pitched in, providing me more material to work with. Others have assisted with translating foreign languages. Still others helped by simply getting the word out. Thanks must go to Chris, in particular, for his excellent contributions. These images are from an Egyptian Cobra HEAT projectile. There is an elongated nose probe forward of the warhead proper. 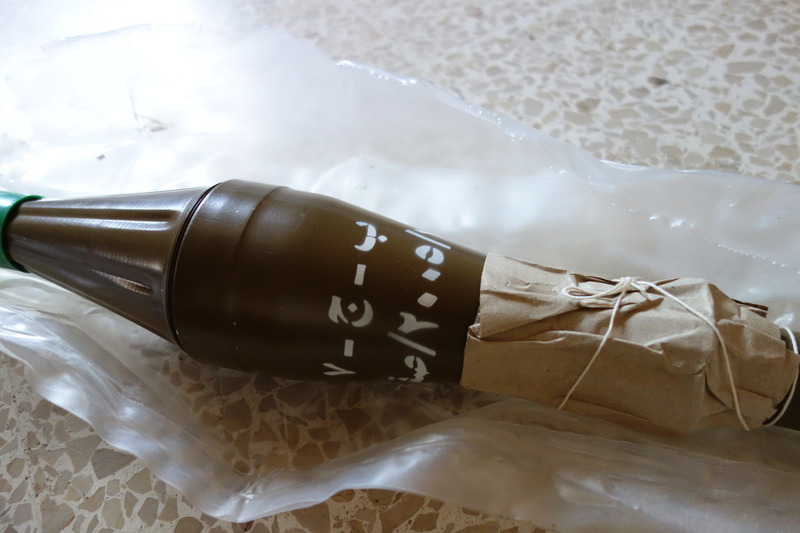 The warhead markings read ‘Cobra’ , indicating this is a unitary Cobra projectile, rather than a Cobra Tandem round, ‘Octogen’, indicating the explosive compound HMX (likely OKFOL; 95% HMX, 5% wax), and ‘2005/Sakr’, indicating the year and factory of manufacture. The tailboom bears the marking ‘SFDI’ for Sakr Factory for Development Industries, part of the the state-owned Arab Organization for Industrialisation (الهيئة العربية للتصنيع ). The projectile weight 2.75kg, has an effective range of 300m, and is thought to be approximately 85mm in diameter (see comparative image by Bjørn Holst Jespersen, here). Penetration of Rolled Homogeneous Armour (RHA) is given as more than 500mm. This Egyptian copy of the Soviet PG-7V projectile was also produced at the Sakr Factory for Development Industries (and bears the same ‘SFDI’ mark on its tailboom as the Cobra Tandem above). The PG-7 projectile weighs 2.25kg, and is 85mm in diameter. Armour penetration is approximately 260mm of RHA, and the effective range is in the area of 350m. 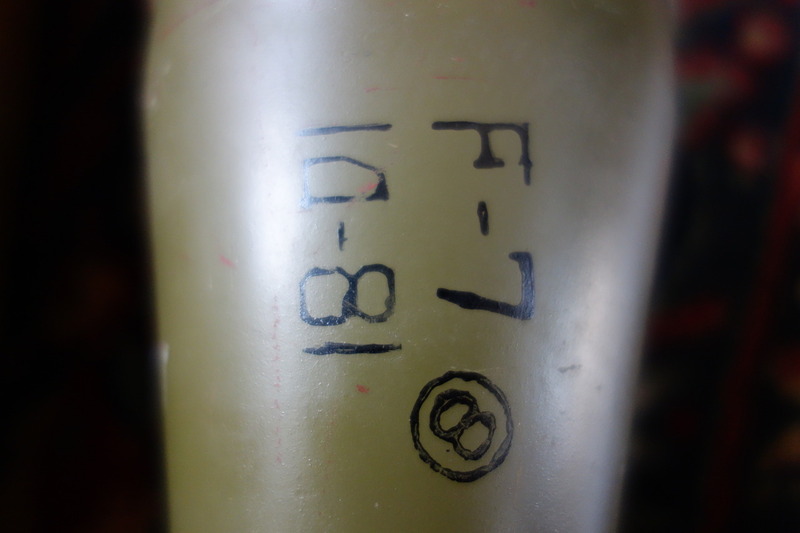 The markings seen on the warhead of this projectile read ‘PG-7’ and ‘Sakr/2005’, again stating the type of projectile, factory, and year of production. 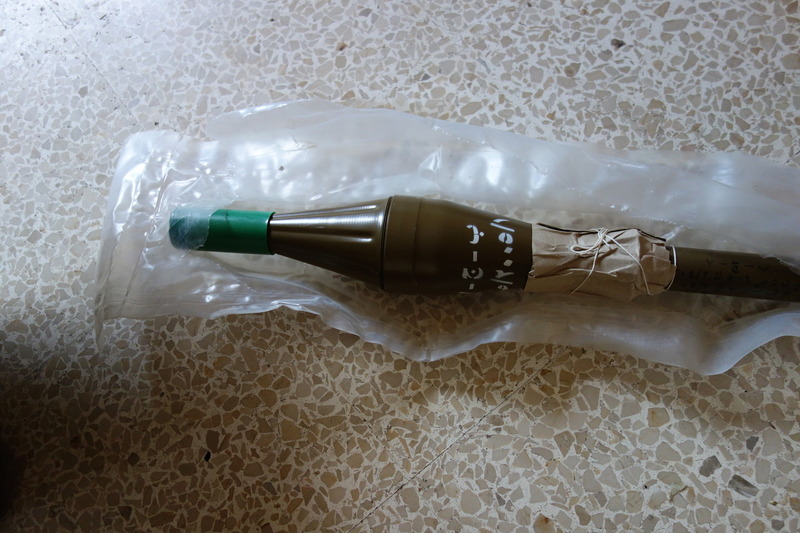 The green cylinder over the nose is typical of packaging for RPG-7 projectiles (usually cardboard or plastic), and is there to protect the top component of the two-part Point Initiating, Base Detonating (PIBD) fuze. Upon impact with the target, the piezoelectric element in the nose cone is deformed, generating an electrical impulse to fire the detonator at the base of the projectile. The PG-7VM HEAT round (at left, in top photo) was originally developed in the Soviet Union in 1969, although this particular example was produced Vazovski Mashinostroitelni Zavodi Co. (VMZ; Vazov Machine Building Factory) in Sopot, Bulgaria in 1986. An improved version of the earlier PG-7V HEAT round (the ‘M’ stands for Modernizirovanii, or ‘modernised’), the PG-7VM is capable of defeating 300mm of RHA whilst weighing in at 1.98kg, 270g less than it’s predecessor. It is 52mm longer than the PG-7V, and has a smooth, rather than fluted, nose cone. It is also a narrower design, with a diameter of 70mm, allowing for more projectiles to be carried in the ‘quiver’ type backpacks occasionally used to transport RPG rounds and making the projectile somewhat less susceptible to crosswinds. The range of the PG-7VM is comparable to the PG-7V at around 350m. The primary explosive compound is A-IX-1, a phlegmatised compound consisting of 96% RDX and 4% paraffin wax. The warhead is fuzed with the VP-7M PIBD fuze. Although it appears externally similar to a PG-7V HEAT round, the North Korean F-7 is actually a high explosive fragmentation (HE-FRAG) projectile. 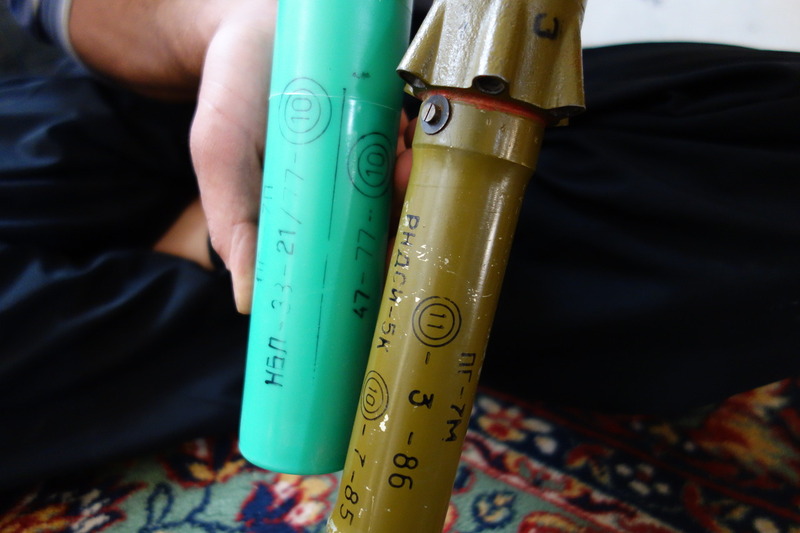 Note the absence of the piezoelectric component of the typical PIBD fuze at the projectile’s nose (though the nose cone is made from typical PG-7 parts, and has the same profile); the F-7 features just a simple impact-activated base fuze rather than the two-piece PIBD fuze seen in many other RPG-7 projectiles. 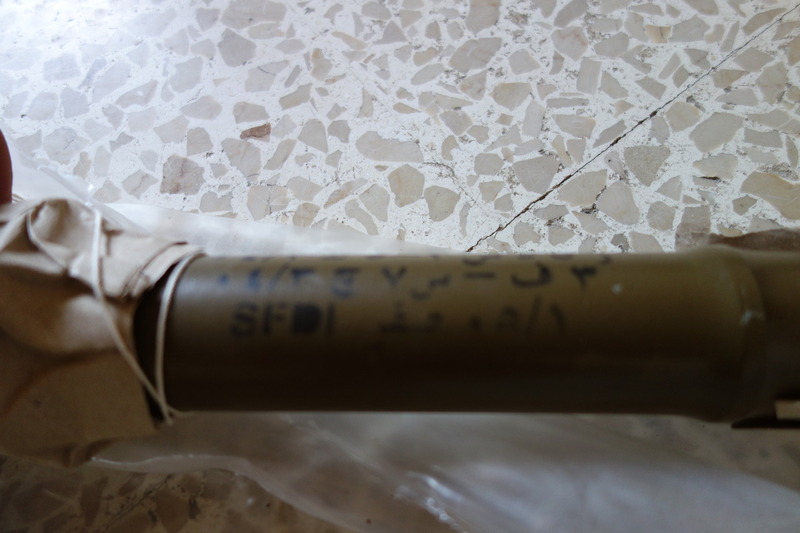 The projectile appears to be the same length (899mm) and diameter (85mm) as a standard PG-7V, and weighs approximately 1.85kg. Rather than a shaped charge designed to penetrate the armour of fighting vehicles, the F-7 contains approximately 255 grams of an undetermined explosive compound [if anyone has information on this, please contact me], and a phenolic resin sleeve embedded with steel balls forming a fragmentation matrix. The cutaway photo below shows the absence of a forward fuze component, as well as a cross-section of the phenolic fragmentation sleeve. The X-ray image below clearly shows the distribution and location of the steel fragmentation spheres. There have been reports of Libyan groups providing, or attempting to provide, North Korean F-7 projectiles to the FSA [Note: this is a known pro-Assad government website]. Credit: the author of these two images wishes to remain anonymous. 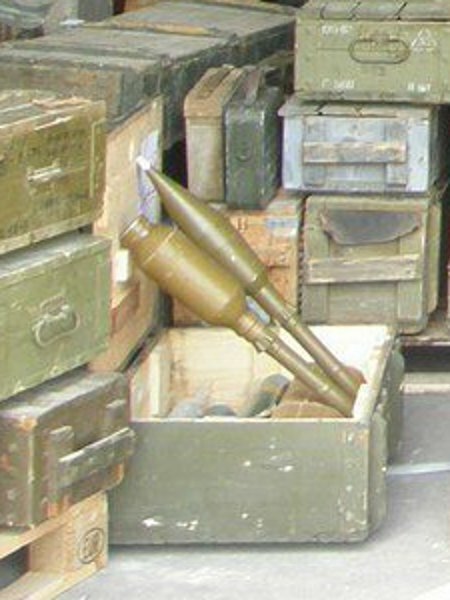 The projectile at right in the image above is a PG-7VL HEAT round, introduced by the Soviet union in 1977 as a further improvement to the earlier PG-7VM (1969) and PG-7VS (1972) projectiles. The PG-7VL is 93mm in diameter, weighs approximately 2.6kg, and contains 730g of OKFOL explosive compound. It is capable of penetrating more than 500mm of RHA, or 1.1m of reinforced concrete. It is primarily intended for use against armoured targets, but the significant quantity of explosive material means that it is an effective weapon for engaging field emplacements or light structures. 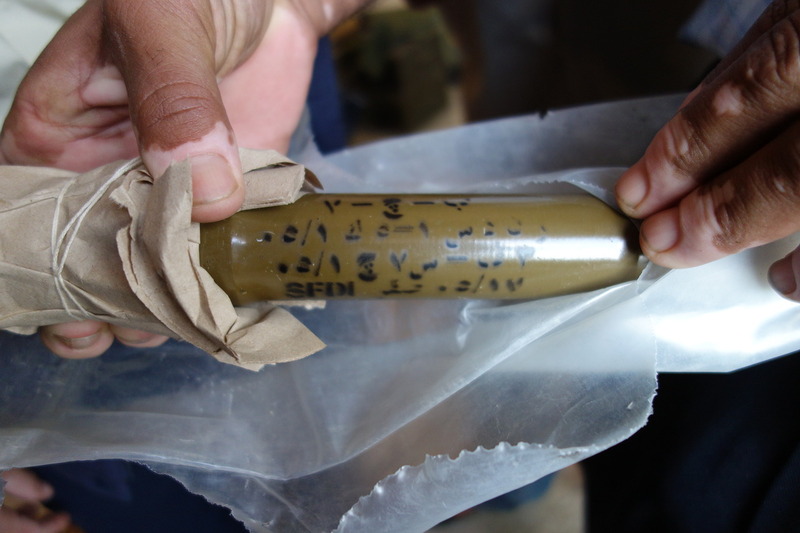 The photo above comes from a series of images purporting to show captured materiel sent from Libya and intended for the FSA [Note: this is a known pro-Assad government website]. 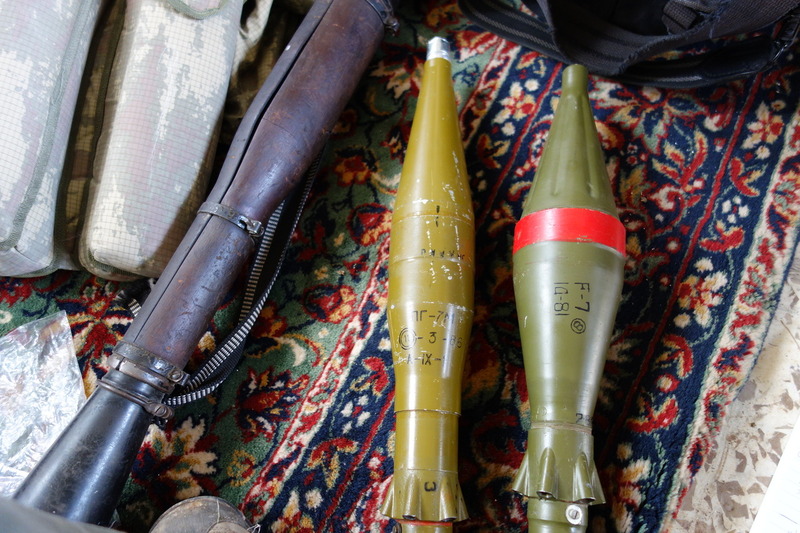 These projectiles did not actually make it into Syria, however others most certainly did. The shipping document below, photographed by C.J. Chivers in Jebel al-Zawiya last month, describes the delivery of a case of six PG-7VL projectiles from the Russian state-owned GK Rosvooruzhenie (the precursor to today’s JSC Rosoboronexport) to the Syrian Ministry of Defence, in November 1998. 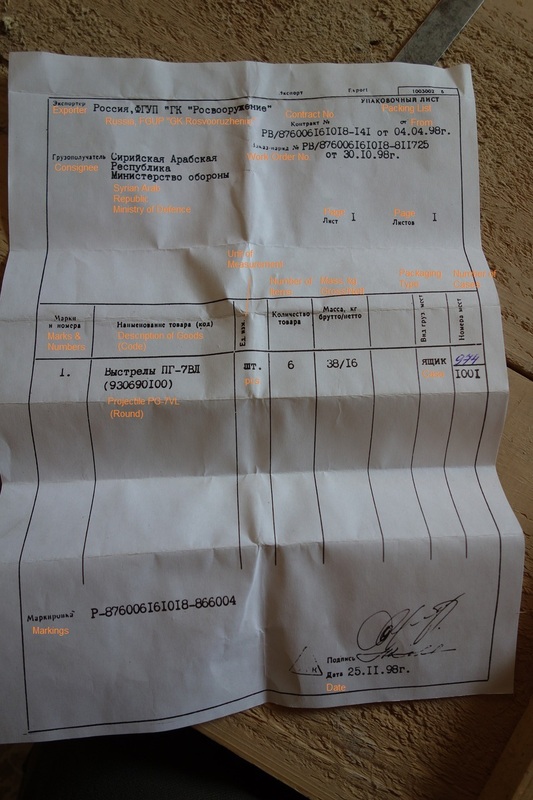 The document refers specifically to case 974/1001. Were all 1001 cases to contain PG-7VL projectiles packaged in the same manner, the contract may have been for over 6,000 rounds. I have annotated the document with English translations, as provided to me. 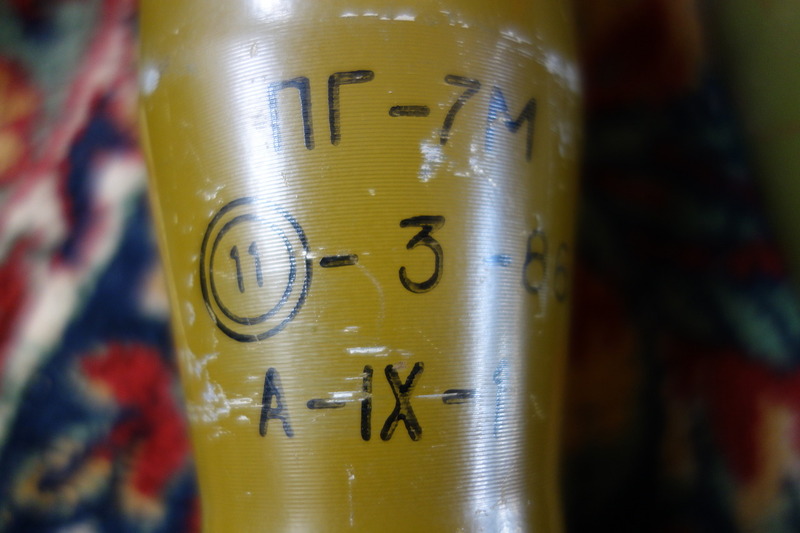 A note on RPG-7 projectile designations: When dealing with the projectiles of the Soviet Union/Russia (and several other former Eastern Bloc countries), the ‘V’ in the designation stands for ‘vystrel‘, or ’round’, referring to both the projectile, and the propellant (or in this case expelling) charge. This expelling charge, often referred to as a booster section, launches the projectile out of the barrel (at 117m/s, in the case of a PG-7V), before the rocket sustainer motor kicks in around the 11m mark, accelerating the projectile towards its maximum velocity (294m/s, in the case of the PG-7V). Hence ‘PG-7’ refers specifically to the projectile alone, whilst ‘PG-7V’ refers to the round in its entirety (whether assembled or not). Many thanks to C.J. Chivers, Lens Young Homsi, MP.net member m4rs75, and sources who have elected to remain anonymous. Cheers also to Travis Owen for assisting with the translation of the Arabic text, to Ivan Kochin for assistance with the Russian text, to Alex Diehl for technical input, and to fellow members of BOCN for their assistance. 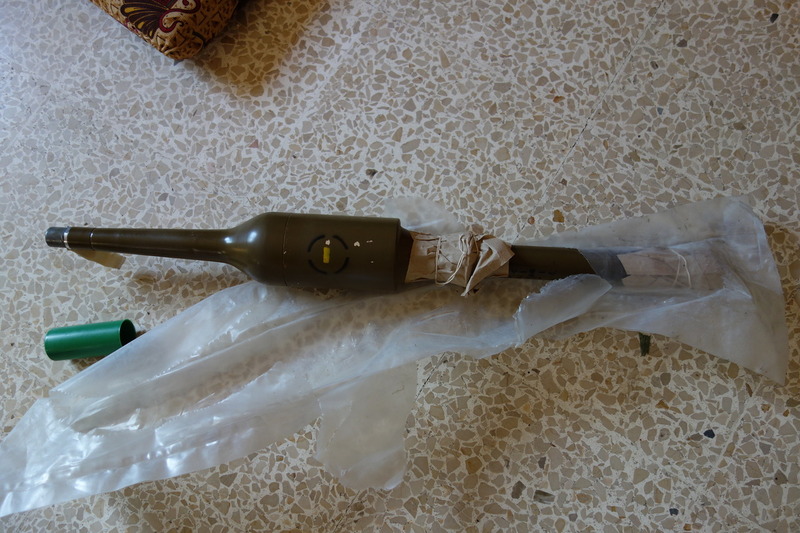 Should you have more images of RPG-7 projectiles in Syria, please don’t hesitate to get in touch with me. This is an excellent resource keep up the good work! good job (-; but there is a single mistake. the Egyptian COBRA projectile is a single warhead type. the (COBRA Tandem) projectile has more elongated prob to satisfy the new (standoff )distance. Thanks for the comment, and my apologies for the slow reply. 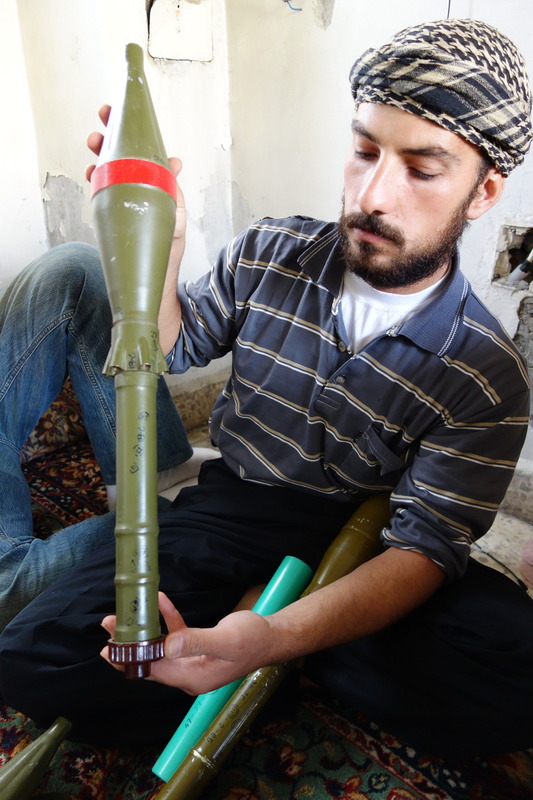 I spent some time verifying this information, and you are correct to state this is a unitary warhead shown. The post has been updated to reflect this. I did try emailing you several times; if you have an image of a Cobra Tandem projectile, it would be much appreciated.